'A Dream Come True' As New Orleans Plays In The First Four : The Two-Way After a huge decline in enrollment following Hurricane Katrina, the University of New Orleans considered dropping its sports program from Division I. But it reconsidered and today joins March Madness. 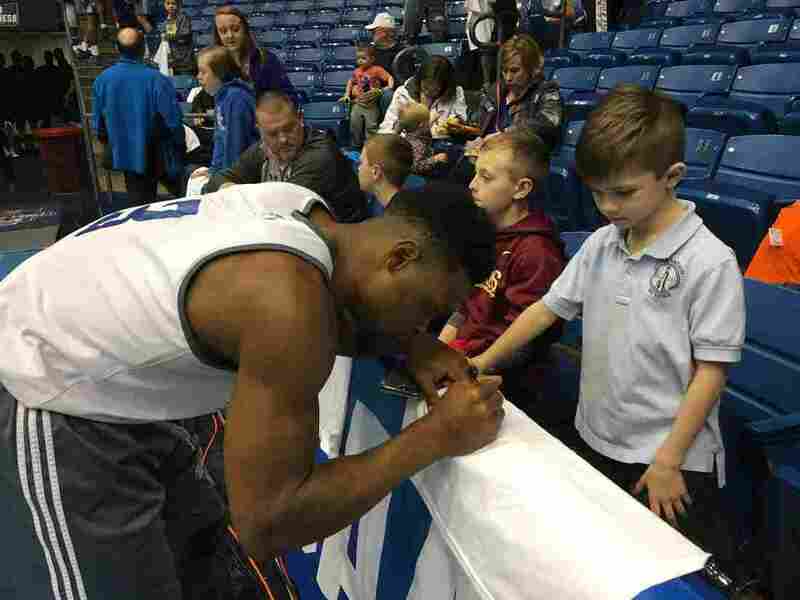 New Orleans Privateer guard Nate Frye signs autographs after a Monday practice at the University of Dayton Arena. Frye, a senior, joined the team when it was going through a difficult period of deciding whether it had the resources to compete in Division I. The NCAA Division I men's basketball tournament begins today with a game, if history holds, that will have absolutely no bearing on the ultimate tournament outcome in early April. The University of New Orleans and Mount St. Mary's University kick things off at the First Four in Dayton, Ohio. Both teams are No. 16 seeds, the lowest, and they're playing for a shot at the highest seed. The winner moves into the main draw to play Villanova — the tournament's overall No. 1. No 16 seed has ever beaten a 1 seed. But New Orleans head coach Mark Slessinger refuses to see his Privateers as potential cannon fodder. "It would be hard for me to believe that anybody [in the tournament] could appreciate this moment more [than this team]," Slessinger said Monday in Dayton. Today is New Orleans' first tournament appearance since 1996. But what really makes the Privateers appreciate this moment is the fact that within the last five to 10 years, there was a very real chance this Division I basketball team would be no more. After Hurricane Katrina ravaged New Orleans in 2005, University of New Orleans enrollment was decimated. UNO traditionally has drawn students from the city, and many fled after the storm. "[Enrollment] was around 16,000 before the storm and we're a little over 8,000 now," says Jude Young, a New Orleans native and for the past four years the broadcaster who calls Privateers games. "Without [student] fees it was real difficult for the athletic department and they were making cuts everywhere," Young says, adding, "The state of Louisiana also slashed budgets for higher education in recent years. That combination was really difficult." The athletic department reportedly was part of the problem as well, being indecisive at a critical time. In 2009, the school considered a dramatic money-saving step — dropping sports from Division I to Division III. Division III schools are prohibited from awarding athletic scholarships. Instead UNO then considered going to Division II, until finally announcing, in 2012, that it would remain a D1 school. It was during that period that current senior guard Nate Frye first signed up to go to UNO and play basketball. "[My] first year, we couldn't really compete for anything because we were transitioning from D2 to D1," Frye says. "So when I signed they were straight up and said we can't compete. But they said we'll get you here and they kept their promise." "Here" is the NCAA tournament. "Dude, it's a dream come true," Frye said Monday after a practice session at the University of Dayton Arena. "Things were looking pretty bleak but coach stuck with us and we stuck with coach. And we finally made it." And Frye is making the most of it. He and teammates signed autographs for kids after practice. Sometimes athletes will give a perfunctory scribble and not acknowledge the people waiting for their signature. But the Privateers were the sports cliché "happy to be here" come to life. At one point, a man who had brought several of the kids courtside told them it was time to pack up their stuff and leave. "Hold on! Hold on," Frye said. "One more from my phone if you don't mind." Frye had been taking selfies with several kids' phones. "All right you guys," he said, posing with a half-dozen young fans, "this one's for the Snap[chat]. One, two, three. All right, cool." For many basketball fans, the First Four is the appetizer before Thursday's entrée. For the teams here, being a hoops spring roll isn't such a bad deal. Tuesday and Wednesday, teams without much chance of going far are the show. They don't have to compete with the craziness of all the other games in other regions. Hoops junkies may grumble about Dayton not being "the real tournament," but they'll tune in. Of course, this moment in the limelight is destined to be short-lived. It could be over tonight for the Privateers, who are led by four seniors, including Frye, and the Southland Conference player of the year, forward Erik Thomas. Or with a win over Mount St. Mary's, the ride could continue until Thursday and a date with Villanova. "No one needs a record book about that," says Privateers broadcaster Jude Young. "16 are oh-fer against No. 1! But hey. Why not us?"